UBER GRINDER RESEARCH - Marco Beverage Systems Ltd. I visited Ditting in Zurich, Switzerland recently to continue the research we are carrying out together to advance the Marco Uber Grinder and learn more about burr design and grinder production. While we considered other improvements to the Uber Grinder, for now we decided to stick to the primary task at hand – continue to focus on the grind profile. Bottom line? The grind profile is king. I believe the best profile is one which has a tight peak at 600-800 um range (dependant on brew method/volume/contact time). Why? I believe this for three reasons; Logic, Taste, Physics. 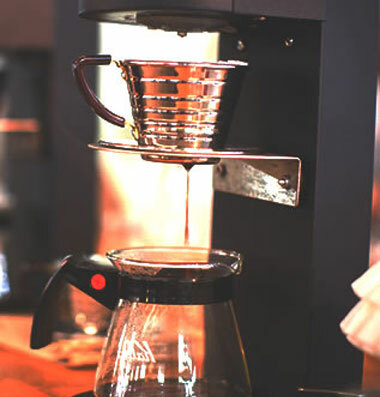 Logic dictates a mix of fine and coarse grinds exposed to the same temperature water for the same duration will result in uneven extraction, whereby the fines extract more and the coarse less. Taste Try it – using a sieve, take out all the fines below 600um and compare it with a brew using a normal profile. The difference is stark and for me positively so. We use endecotts sieves. Physics Best illustrated (in a not very laboratory but perfecty understandable way)in this great post by David Walsh – go to the thread and read David’s coments also. So you may remember we set out to cut burrs which would give the best results, as we saw it. From previous research, we sent Ditting off to play and tell us something new. The guys carried ot some great research, exploring different burr profiles, accelerator inserts, various glass bead ‘seasoning’, motor speeds, burr dimension and more. Ditting cut some new burrs, modified some existing ones and took resultant grind samples to profile them on their very impressive laser particle analyser machine. A small sample, approx 10g, is fired at speed and a video is taken of the particles shooting past. This video is then converted into a plot, detailing particle size distribution. I will post separately on the grind profiles yielded by the these burrs and more. To post them here will result in a monster of a post which is counter productive to both me and you. WHERE IS THE UBER PROJECT?